Quite some time ago, I purchased a bag of veggie rotini: enriched macaroni, spinach macaroni, and tomato macaroni strictly for visual purposes. In other words, it was pretty. Since then, due to a certain lack of creativity on my part pertaining to pasta sauce, it has languished in the pantry. Last week, while browsing through a cookbook at the local library, a light bulb came on in my head. This would be the perfect sauce for my veggie rotini. This recipe is from Sandra Woodruff's Secrets of Fat-Free Italian Cooking . 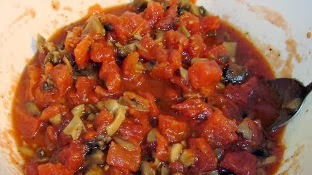 Broiled Portabella and Plum Tomato Sauce has 31 calories per 2/3 cup serving. 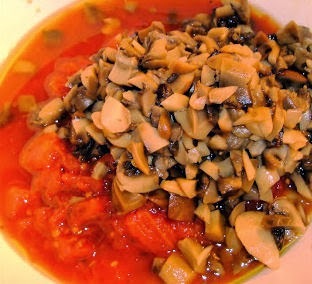 1) First, place the mushrooms, tomatoes, garlic, oregano, salt, pepper, and if desired (I do! ), the olive oil in a large bowl. 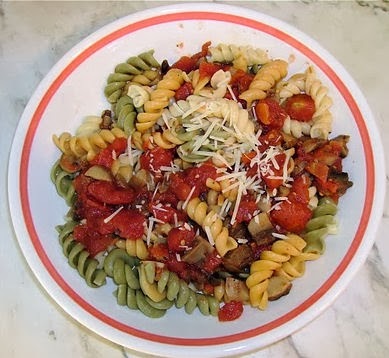 Not having any fresh mushrooms or tomatoes in the pantry, I substitute two 4 oz cans of portabella mushrooms and one 12 oz can diced tomatoes flavored with garlic, basil, and oregano. I don't add any extra garlic or oregano. 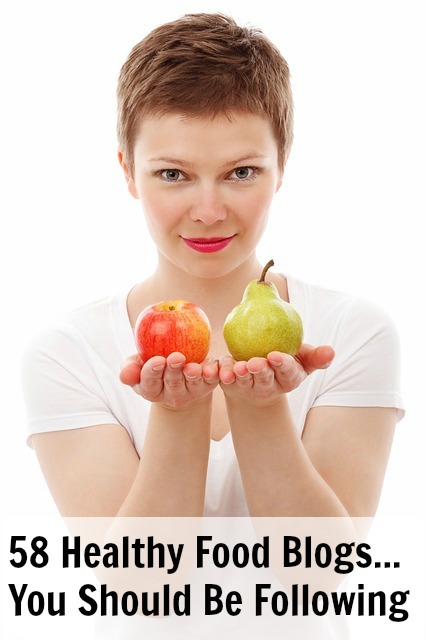 2) ﻿Toss the ingredients to mix well. 3) Next, coat a large baking sheet with (Mazola Pure--Olive Oil) cooking spray, and spread the mixture in a single layer over the sheet. If you did not use the olive oil in the mixture as I did, spray the top of the tomato mixture lightly with cooking spray. 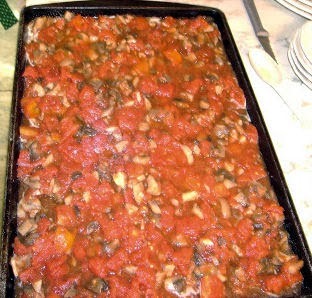 4) Place the tomato mixture 6 inches below a preheated broiler, and broil for about 5 minutes, or until the tomatoes are soft and the mushrooms begin to brown. Serve hot over your choice of pasta. 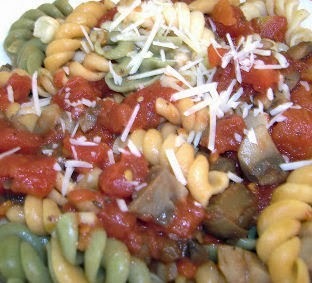 Serve over veggie rotini and sprinkle a smidgen of low-fat mozzarella over the top. So deliciously savory!